Master the art of painting an extensive range of textures in oil and acrylic paint with step-by-step instructions. 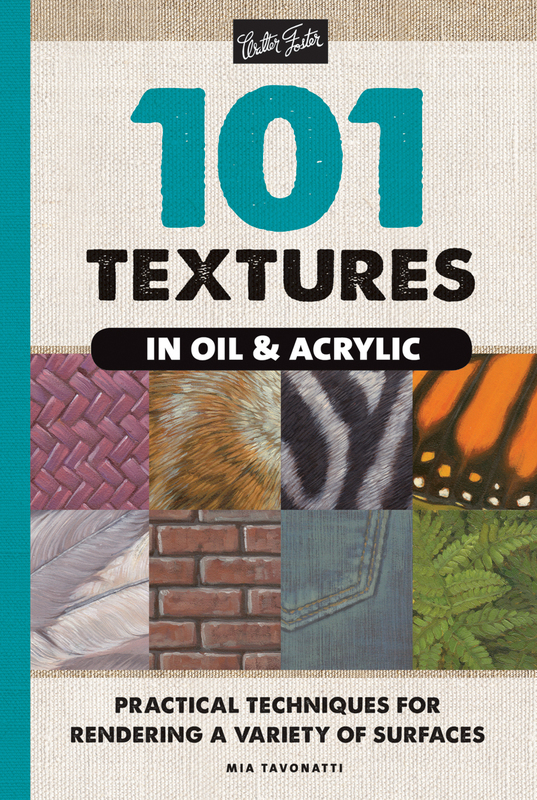 101 Textures in Oil & Acrylic features step-by-step instructions for mastering a variety of the most common surfaces - sand, water, metals, foliage, wood, bark, fabrics, stone, grass, and many more - in oil and acrylic paint. Each page features two similar textures for readers to paint using the easy-to-follow steps. Half the battle of achieving precise, realistic results in oil and acrylic painting comes down to one’s ability to accurately render surfaces and textures - a challenging feat for even experienced artists. Although many art instruction books focus on learning to paint specific subjects, many fall short when it comes to offering instruction on techniques that help one capture textures adequately. In 101 Textures in Oil & Acrylic, experienced and talented artist Mia Tavonatti provides artists with the essential skills required to render realistic surfaces in oil and acrylic. Artists will discover tips and tricks for working with both mediums, as well as a variety of techniques, including blending, layering, working with oil and acrylic mediums, creating an underpainting, and more. In addition to valuable step-by-step instructions, general color recommendations offer a quick start guide. This helpful guide includes an index for fast and easy reference, while a short gallery at the end of the book represents various textures in finished works of art. With its broad range of coverage, easy-to-follow instruction, and helpful tips, 101 Textures in Oil & Acrylic is a must-have art instruction book for artists of all skill levels, sure to be referenced time and again. Mia Tavonatti is an artist with a variety of interests, including a strong passion for painting and drawing. She moved from Michigan to California to attend art school at California State University, Long Beach, where she earned her BFA and MFA in illustration. She has also studied painting abroad, and she loves to spend her summers painting in Greece. Mia has exhibited her work extensively, both in Europe and throughout the United States. She is the recipient of numerous scholarships and awards, and her work can be seen on more than 45 book covers and in several magazines.